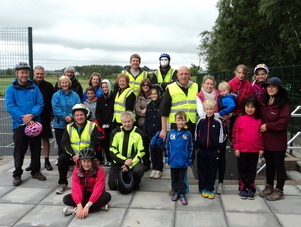 Our Family Bike Ride took place today in Rainford to raise funds to develop tennis in the village. Having raised funds through sponsorship, Club members and their friends and family took to the road to cycle round Rainford in a event that was thoroughly enjoyed by all those in attendance. "We would like to thank everyone who came to our Family Bike Ride today" said organiser, John Case. "We would like to thank everyone who has supported tennis in Rainford. We will be running more social and fundraising events in the future, which will be advertised on our Club website."